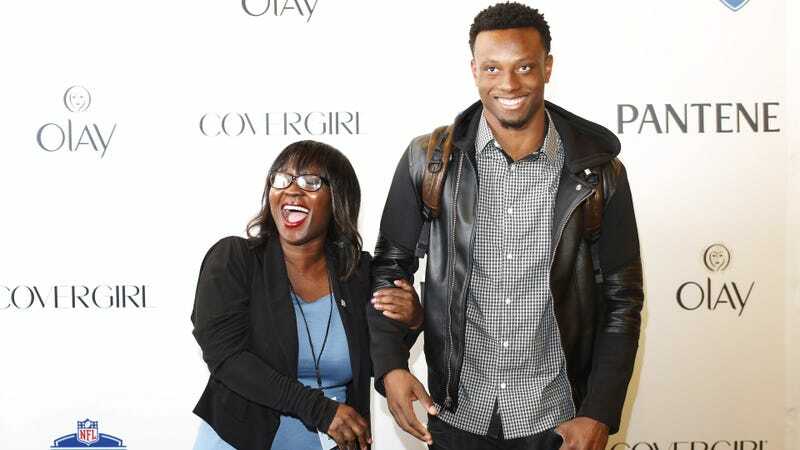 Annie Apple, a contributor to ESPN’s Sunday NFL Countdown and the mother of New York Giants rookie Eli Apple, was outspoken about Giants owner John Mara’s comments on what the team knew about kicker Josh Brown’s extensive history of assaulting his wife. Now she’s dedicated her most recent column at Sports Illustrated to her own harrowing experiences as a domestic violence survivor. The comments made by John Mara, owner of the New York Giants, were insensitive, dismissive and callous. How are you a so-called champion of domestic violence but lack basic compassion for a victim? Yes, this man signs my son’s checks as I’ve been reminded on Twitter. Mr. Mara owns the New York Giants. He doesn’t own Annie Apple. Wrong is wrong. And Mr. Mara’s comments were unapologetically wrong and hit at a raw place. I am a domestic violence survivor. Apple’s gives an account of her relationship with and marriage to a man who she says habitually abused her during their four years together. The man, Apple says, was abusive to her even when she was pregnant, and once kicked her in the stomach days after she returned home from the hospital after having a C-section. Apple’s story is best read in full, as she demonstrates how abusive partners cultivate power over their victims, often trapping them in a years-long cycle of apology, abuse, apology, abuse. What victims need is for someone to stand up for them and defend them because they live defenseless lives; they need someone who will take a stand and say the violence suffered was wrong and criminal. One of the worst things you can do to a domestic violence victim or survivor is to defend the abuser. These abusive men aren’t abusing the women in their lives because they’re sick. These abusers are not the victims. They’re abusing women because they can. These men are not beating their co-workers, neighbors, priests, doctors and teammates. They’re abusing their wives and girlfriends because they can. To some with whom I’ve shared my story, the response is usually: “How could that have happened to you? You’re so smart, strong, bubbly and outgoing.” Domestic violence is perpetrated on strong women, smart women, poor women, rich women, even bubbly women. It happened to me, and every day it happens to millions of others just like me. The Giants traveled to London without Josh Brown this week. He is currently on the Commissioner’s Exempt list. My mom’s very vocal and that topic is very important to her, so I can understand where she was coming from. But at the same time in my position I just have to do my part and play football and do what I can do.